Crockett played at cornerback and free safety in college and was chosen by the Broncos in the fourth round of the 1989 NFL draft. Despite lacking ideal speed he moved into the starting lineup during the 1990 season and improved over the course of the year. 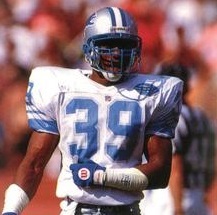 An excellent athlete who could be reckless, he had a breakout season for the much-improved Lions in ’91. Lions went 12-4 to finish first in the NFC Central. Won NFC Divisional playoff over Dallas Cowboys (38-6). Lost NFC Championship to Washington Redskins (41-10). Crockett, playing with an injured ankle in 1992 followed up with four interceptions and 52 tackles. He spent one more season with Detroit before departing for Denver as a free agent in 1994. Crockett spent seven years with the Broncos and started at LCB in the 1997 and ’98 seasons when Denver won NFL titles.He finished up with the Kansas City Chiefs in 2001 and ’02. Overall, Crockett intercepted 36 passes, 16 of them as a member of the Lions.He also was credited with 15.5 sacks. Dumervil was credited with 151 tackles in 44 college games as well as 32 sacks and was selected as Big East Defensive Player of the Year in 2005 when he recorded 20 sacks. He was chosen by the Broncos in the fourth round of the 2006 NFL draft with the anticipation that while lacking ideal height that his speed would make him an effective situational pass rusher. Dumervil had 8.5 sacks in that role as a rookie. He moved into the starting lineup in 2007 and accumulated 12.5 sacks and had four takeaways while encountering problems against the run. His sack total dropped to five in 2008 with 49 tackles.Dumervil was shifted to right outside linebacker with outstanding results in 2009. Broncos went 8-8 to finish second in the AFC West. Dumervil missed the entire 2010 season due to a torn pectoral muscle. 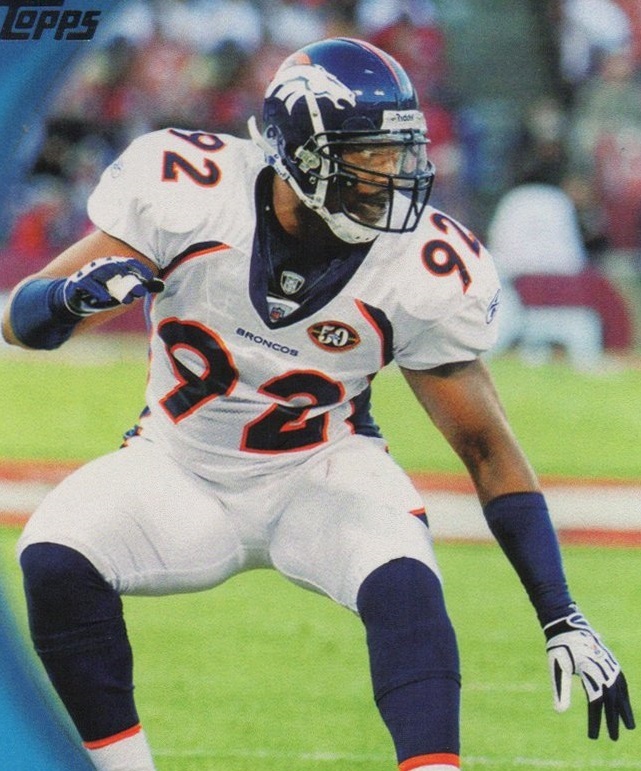 He returned to defensive end in 2011 and regained Pro Bowl recognition with 9.5 sacks.He spent two more Pro Bowl years with Denver before signing with the Baltimore Ravens in 2013 and returning to outside linebacker. He recorded 9.5 sacks in ’13 and 17 in 2014, when he was a consensus first-team All-NFL as well as Pro Bowl choice.Following lesser seasons in 2015 and ’16 Dumervil was released by the Ravens. Overall through 2016 he has been credited with 99 sacks and some 225 tackles with 63.5 sacks coming while with the Broncos. He has received first-team All-NFL honors twice and been selected to five Pro Bowls. A world class sprinter, Hayes first achieved fame for setting a world record of 9.1 seconds in the 100-yard dash. He also set an Olympic record in winning the 100-meter dash in the 1964 Tokyo Games. He also won gold by anchoring the successful US effort in the 4X 100-meter relay. The recipient of a football scholarship to attend Florida A & M was chosen as a future pick by the Cowboys in the seventh round of the 1964 NFL draft (the Denver Broncos picked him in the 14th round of the corresponding AFL draft). While he was a raw talent who needed to develop technique to complement his great speed, “Bullet Bob” moved into the starting lineup as a rookie. Cowboys went 7-7 second in the NFL Eastern Conference (tied with the New York Giants. Hayes followed up by catching 64 passes for 1232 yards (19.3 avg.) and a league-leading 13 TDs in 1966 and was again selected to the Pro Bowl as well as receiving first-team All-NFL recognition from the Pro FootballWriters, NEA and the Associated Press. He went on to spend ten seasons eith the Cowboys. 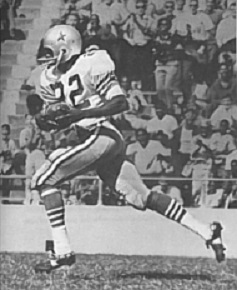 In addition to being a productive receiver that opposing defenses had to account for, “Bullet Bob was also a fine kick returner who led the league with a 20.8 punt return average in 1968.Overall with Dallas Hayes had 365 pass receptions for 7295 yards (20.0 avg.) and 71 touchdowns. In addition he returned 104 punts for an 11.1-yard average and three TDs and 23 kickoffs with a 25.3-yard average.He caught another 31 passes for 492 yards (15.9 avg.) in 15 playoff games that included two touchdowns. Hayes was traded to San Francisco in 1975 but was released after catching just six passes for119 yards,thus ending his career. He received first or second team All-NFL honors after four seasons and was selected to three Pro Bowls. Hayes was inducted into the Pro Football Hall of Fame, Class of 2009. 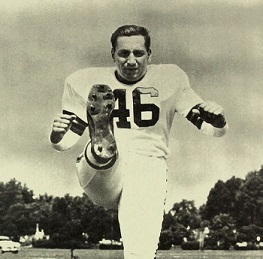 Groza saw little college action before going into the military during World War II, but Paul Brown signed him for the Browns of the new AAFC for 1946. In his first season, he was used primarily as a placekicker who backed up on the offensive line. Browns went 12-2 to finish first in the AAFC Western Divisionwhile leading the league in total yards (4244), touchdowns (55), and scoring (423 points). Won AAFC Championship over New York Yankees (14-9). 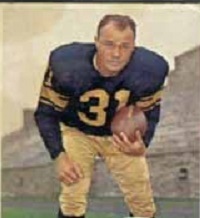 Groza became a starting tackle during the1947 season and excelled there, if not as visibly as he did with his kicking. With Cleveland joining the NFL in 1950, he led the league in field goals (13) and field goal percentage (68.4), kicked the game-winning field goal in the NFL title game, and was named to the Pro Bowl for the first of six straight seasons. He again led the league in field goals in 1952 (19) and ’53 (23) and was successful on 88.5 % of his attempts in the latter year. Groza receivedleague MVP recognition from TheSporting News in 1954when he led the NFL with16 field goals out of 24 attempts for a league-leading 66.7 percentage and along with 37 extra points ranked third in scoring with 85 points. The best placekicker of his era, “The Toe” also continued to be an outstanding tackle. He was again a consensus first-team All-Pro and Pro Bowl selection in 1955, led the NFL in field goals in 1957 (15) and was named to the Pro Bowl in ’57, ’58, and ’59 for a total of 9 in all. 1959 marked his last season as a tackle and he retired for a year in 1960 due to a back injury. He returned as strictly a placekicking specialist in 1961 and led the league in field goal pct. that year (69.6) and again in 1963 (65.2). He finally retired for good following the 1967 season at age 43 and after a total of 21 years (four in the AAFC, 17 in the NFL). At the time, he was the NFL career leader in games played (216), scoring (1349 points), field goals (234), and extra points (641). Adding in his AAFC totals, he played in 268 games, scored 1608 points, and kicked 264 field goals and 810 extra points. The Browns retired his #76 (which he wore for the last 15 years of his long career) and he was inducted into the Pro Football Hall of Fame, Class of 1974. 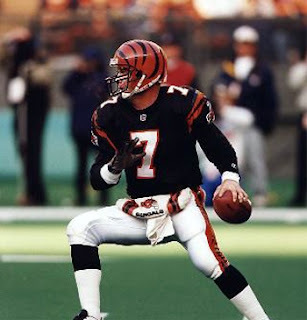 Taken by the Bengals in the second round of the 1984 NFL draft, the left-handed Esiason replaced Ken Anderson as the starting quarterback in ’85. An accurate passer with a strong arm and good mobility, he led the league in TD percentage (6.3) in 1985 with 27 touchdowns to just 12 interceptions. He was selected to the Pro Bowl in ’86 after passing for 3959 yards and averaging 8.4 yards per attempt as the Bengals improved to 10-6. Bengals went 4-11 in the strike-shortened season (three games were played with replacement players) to finish fourth in the AFC Central. Esiason followed up with an MVP season in 1988as he led the league in passing with a 97.4 rating and Cincinnati won the AFC title. He had another Pro Bowl season in 1989, with nearly identical numbers to ’88, although the team’s record dropped to 8-8. After three disappointing seasons in 1990, ’91, and ’92, he was traded to the New York Jets and was selected to a fourth Pro Bowl in 1993, although his performance dropped off in the second half of the year. The next two years with the Jets, a team in flux, were mediocre and Esiason moved on to the Arizona Cardinals, where he threw for 522 yards in one game but otherwise had an inconsequential season. He returned to Cincinnati for one last, good year in a part-time role in 1997 (five starts, but a 106.9 passer rating with 13 TDs and just 2 INTs) before retiring to the broadcast booth. Overall, Esiason passed for 37,920 yards with 247 TDs against 184 interceptions.